February 1, 2011 | Célestin Musekura’s mother had been presumed dead in the 1992 Rwandan genocide. Many months later, though nearly their entire village had been destroyed, she was found alive. A decade later, Musekura recounted the tale to L. Gregory Jones, then the dean of Duke Divinity School, over dinner. Jones asked Musekura where his mother was now. “At home in Rwanda,” Musekura said. “And who cares for her?” Jones said. That’s what Jones and Musekura, founder of African Leadership and Reconciliation Ministries (ALARM), which trains civilian and religious leaders across east and central Africa in character building, theology, conflict resolution, community development and forgiveness, set out to answer in “Forgiving As We’ve Been Forgiven.” The book, which they co-wrote, interweaves Musekura’s story with a guide on cultivating the habits of forgiveness. The following excerpt from a chapter written by Jones outlines six steps to embodying forgiveness. I have a friend who recalls taking ballroom dancing lessons on Thursday nights when he was in high school. The instructor was a stern old German man who broke the waltz into its basic steps, demonstrated each move with clear definition and then barked out numbers while each member of the class practiced. Having signed up for the class in the hopes that it would help him impress the girls at the homecoming dance, my friend almost lost his resolve. There was nothing graceful about his jerky movements or the cadence of a waltz barked in a thick German accent. But after a few weeks of practice, the old German instructor put an album on the record player, grabbed one of the young women in the class and swept her off her feet, spinning around the room with her in graceful circles. My friend says he decided to stay and finish the course when he finally saw how all the steps came together to make a dance. One of the ways Christian theologians have described the relationship between Father, Son and Holy Spirit is as a dance in which three persons, always giving themselves to one another in perfect love, are at the same time three and one. The love of the Trinity spills over into their love for us, people who are created by God for communion. Because forgiveness is at the heart of the God whom we worship as Trinity, we are swept up into that movement of God’s love when, by the power of the Spirit through the redemptive work of Jesus Christ, we join the divine dance by being forgiven so we can also forgive. Nothing in this world is more beautiful than seeing broken people healed through God’s forgiveness, learned and lived in the body of Christ, as they are swept up into God’s dance. But learning the dance of forgiveness is not easy. Our hearts, souls, minds and bodies are deeply formed by the habits of sin and evil. Despite our destiny for communion, we human beings do not typically give and receive freely with one another, and certainly not with any trusting expectation. Instead, we often attempt to secure our lives at the expense of others. In short, we are well practiced in the steps that lead to mutual destruction and death while we know precious little of the steps that make up the divine dance of forgiveness. So, at the risk of causing the same frustration my friend experienced in his high school dance lessons, I want to outline six steps of the dance that we are invited into as we learn to embody forgiveness. Learning the alternative life-giving way of forgiveness takes time and involves hard work. It happens as we practice these steps in real community with other people, depending on God’s Spirit to guide us as our thoughts and desires are being transformed. In learning the dance we discover that our movements are undergirded by God’s grace, shaped and sustained by the power of the Spirit. The six steps, which follow, can be identified separately to help us in rehearsal. But when it comes to the Big Dance -- life in beloved community -- they are integrally related, as inseparable as the graceful movements of two people spinning together around a dance floor. Step 1: We become willing to speak truthfully and patiently about the conflicts that have arisen. This is not easy, not the least because we often cannot even agree about what it is that happened. It’s hard enough with two people, and becomes immeasurably more complicated when multiple parties are involved. This is why we need not only honesty but also patience, the virtue that the ancient theologian Tertullian called “the mother of mercy.” When we try to be patient and truthful, we can discern more clearly what is going on. In a gathering that was hosted at Duke Divinity School, a man from Burundi reflected on the racial classifications of “Hutu” and “Tutsi,” the distinction that had meant life or death in Rwanda’s genocide. He recalled how, when he was growing up, he was told that Tutsis were tall people with long noses and Hutus were short people with small noses. This always confused him, however, because his mother was taller than his father, though she was classified as a Hutu and he as a Tutsi. These inconsistencies forced him to ask where such a classification system had come from and why it was so important. Struggling with that question in a Christian fellowship in college, he had begun to see how the gospel challenged divisions he had inherited and assumed. Many years later, he runs a Christian reconciliation ministry in his home country. Churches are often fragmented by divisions that, like “Hutu” and “Tutsi” classifications, are fraught with inconsistency yet hard to name because they are so much a part of our daily lives. We cannot pretend that these divisions simply disappear when we accept Jesus as our personal Savior, get baptized or commit ourselves to the ministry of reconciliation. We must, rather, take the time to talk to one another about the things that divide us. This is an urgent task, Jesus insists -- more important, even, than our offerings to God: “So when you are offering your gift at the altar, if you remember that your brother or sister has something against you, leave your gift there before the altar and go; first be reconciled to your brother or sister, and then come and offer your gift” (Matthew 5:23-24). Wherever we are, we must begin now. But we cannot assume that every conflict will be resolved by sundown. While we must be quick to take this first step, the response we hope for requires patience. Forgiveness takes time. Step 2: We acknowledge both the existence of anger and bitterness, and a desire to overcome them. Whether these emotions are our own or belong to others who are mad at us, it does no good to deny them. Besides, anger can be a sign of life. We should be more troubled by those whose passion is hidden or, worse, extinguished. As we noted when looking at the pitfall of costly despair, bottling up our feelings can be extremely dangerous for ourselves and those around us. We learn to overcome bitterness as we begin to live differently through practices that transform hatred into love. Two years later she wrote me a letter and said that she still could only call out his name. “But,” she added, “I hope you are still praying for him.” Her anger and bitterness are still real, and she’s not ignoring that. As a Christian, though, she wants to overcome them and has entered into a practice of prayer in community. It may take a very long time, but we believe that the power of God is what draws us into and sustains this dance. If Christ is risen, death is defeated. Even our deepest hatred can be transformed into love. Step 3: We summon up a concern for the well-being of the other as a child of God. Sometimes our partner in the dance of forgiveness is a total stranger; at other times, he or she is intimately connected to us, someone from whom we have been estranged. Either way, seeing as children of God the ones on whom our bitterness focuses challenges our tendency to perceive them simply as enemies, rivals or threats. Now they are potential friends in God. Sister Helen Prejean concludes her powerful book “Dead Man Walking” by recounting a conversation she had with Lloyd LeBlanc, a man whose son was brutally murdered. LeBlanc, a practicing Catholic, told Sister Helen that when he arrived in the cane field with sheriffs’ deputies to identify his son, he knelt by his boy and prayed the Lord’s Prayer. “Whoever did this, I forgive them,” he said. LeBlanc did not deny that he struggled (and continues to struggle) with his emotions, mourning all that he lost when his son’s life was cut short by an act of violence. But he knew from that day when he knelt by his son’s body that his son’s murderer was also made in the image of God. LeBlanc’s capacity to forgive did not come from spontaneous inspiration. We learn from Prejean that LeBlanc has for years gone to a small chapel every Friday morning to pray. He prays for “everyone, especially for the poor and suffering” -- especially, we might say, for those in whom it is most difficult to see God’s image. Prayer is not something LeBlanc decided to do in a time of crisis. The habits of prayer were, rather, already so much a part of his life before his son’s murder that I suspect those who know him well would have been surprised if he had not responded by praying the Lord’s Prayer. Prejean indicates that LeBlanc regularly prayed for the mother of his son’s killer, and even went to comfort her before she died. Where she might have been left to face death alone, the dance of forgiveness made it possible for her to be accompanied by the most unlikely of friends. Step 4: We recognize our own complicity in conflict, remember that we have been forgiven in the past and take the step of repentance. This does not mean ignoring the difference between victims and victimizers. People need to be held accountable for their actions. Wrongdoers need to repent and ask for forgiveness, even as those who have been victimized struggle to forgive. Even so, in all but the most extreme cases, we also need to recognize and resist our temptation to blame others while exonerating ourselves. All too often we see the speck in other people’s eyes while not noticing the log in our own (Matthew 7:1-5). We tend to ignore our own wrongdoing. What Célestin learned in his experience with the tribesmen of those who killed his family is true in almost every situation of brokenness and division: repentance breaks the cycle of violence and creates space for God to do something new. How can the one whose family members were killed repent before the family of the killers? Because he has learned the grace of God’s judgment. Jesus Christ is a judge whose judgment does not condemn but rather brings salvation. Because Jesus himself became a human being and a companion of sinners, he has subjected all human judging to judgment. He challenges our tendency to judgmentalism. There was a brother at Scetis who had committed a fault. So they called a meeting and invited Abba Moses. He refused to go. The priest sent someone to say to him, “They’re all waiting for you.” So Moses got up and set off; he took a leaky jug and filled it with water and took it with him. The others came out to meet him and said, “What is this, father?” The old man said to them, “My sins run out behind me and I cannot see them, yet here I am coming to sit in judgment on the mistakes of someone else.” When they heard this, they called off the meeting. Our refusal to judge others is not about minimizing sin; it is, rather, as Abba Moses and Célestin demonstrate, about learning to see the need for forgiveness that we all share in our own lives. This is, in practice, the step that makes healing possible. “To assume the right to judge, or to assume that you have arrived at a settled spiritual maturity that entitles you to prescribe confidently at a distance for another’s sickness, is in fact to leave others without the therapy that they need for their souls,” writes Archbishop Rowan Williams. “It is to cut them off from God, to leave them in their spiritual slavery -- while reinforcing your own slavery.” Taking the step of repentance ourselves, we create space for the healing God wants to give, for the healing that each of us needs. Step 5: We make a commitment to struggle to change whatever caused and continues to perpetuate our conflicts. Forgiveness does not merely refer backwards to the absolution of guilt; it also looks forward to the restoration of community. Forgiveness ought to usher in repentance and change. It ought to inspire prophetic protest wherever people’s lives are being diminished and destroyed. Forgiveness and justice are closely related. To be forgiven is to experience the release and love that enables us to join God’s movement to set others free -- the captives, those who have been condemned to die and all of us who feel we are trapped in death. Learning the dance of forgiveness in a broken and divided world will always mean learning a subversive step that challenges anything that perpetuates brokenness and division. We must not forget that Jesus was executed outside Jerusalem not for revolutionary violence but for forgiving sins. Only God could forgive sins, and the religious leaders of Jesus’ day knew that such an act was a subversion of their power system. This is why they accused Jesus of blasphemy and, along with all of humanity, condemned him to die. In a world where so many people have been crushed by condemnation -- even condemnation “in God’s name” -- the dance of forgiveness requires a step that leads us to stand up for justice and extend the word of God’s forgiveness to all who suffer. In the words of the freedom song, “We who believe in freedom cannot rest until it comes.” If, as Martin Luther King taught us, injustice anywhere is a threat to justice everywhere, then the work of a church that has learned the dance of forgiveness will include working to extend the freedom we have experienced in Christ to all God’s children everywhere. We do well to remember that Archbishop Desmond Tutu, who reminds us that there is “no future without forgiveness,” struggled for decades against the injustice of apartheid in South Africa. He has also embodied faithfulness and superb leadership in the positions of authority in which he has been entrusted. Step 6: We confess our yearning for the possibility of reconciliation. Sometimes a situation is so painful that reconciliation may seem impossible. At such times, prayer and struggle may be the only imaginable options. However, continuing to maintain reconciliation as the goal -- even if this is “hoping against hope” for reconciliation in this life -- is important because it reminds us that God promises to make all things new. Dietrich Bonhoeffer insisted in the midst of his struggle against Nazism that we respond to God’s forgiveness in Jesus Christ by “preparing the way” for the final, ultimate word of God’s forgiveness. Often we are confronted with the reality that we cannot overcome the divisions within our own families, even less the enmity between nations. But we need not lose hope. Every concrete act -- every prayer prayed, every apology offered, every meal shared across dividing lines -- is a sign that our history and habits of sin have been definitively interrupted by the life, death and resurrection of Jesus Christ. This is why the rhythms and practices of forgiveness in community life are so important. They do not wash away all bitterness into a sea of forgetfulness or guarantee that animosity will not erupt in angry words or thrown chairs. 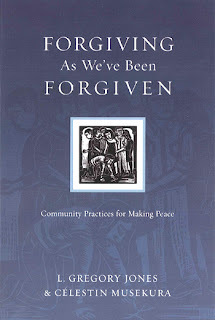 Christian forgiveness assumes, rather, that the Christian community, just like any human community, is broken and in need of healing. We do not gather because we’re already perfect. We gather to learn the steps of faith from a God who is faithful and wants us to join the eternal dance of life abundant in communion. Good habits of forgiveness matter. 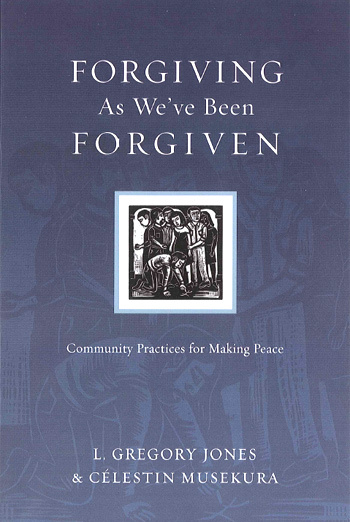 From “Forgiving As We’ve Been Forgiven: Community Practices for Making Peace,” by L. Gregory Jones and Célestin Musekura. Copyright © 2010 by L. Gregory Jones and Célestin Musekura. Used by permission of InterVarsity Press.